Down went De’Ron Davis before the game, out with Achilles soreness. Out went Al Durham Jr. in the first half after landing hard on his back. And out went Romeo Langford late, after he took a head to his face and got a bloodied-up nose. Add them to the list of injured Hoosiers — Devonte Green, Zach McRoberts and Jerome Hunter, Race Thompson — and this team is in serious need of a collective 1-up. So the Hoosiers were left to solider on in this one with a depleted roster, Archie Miller deciding against inserting Jake Forrester, Clifton Moore or Johnny Jager into the game at any time. 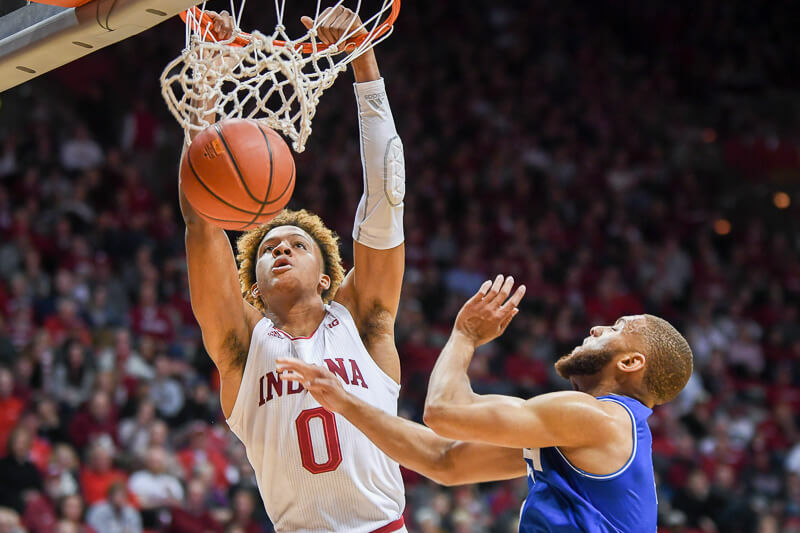 It meant only seven Hoosiers saw the floor — and only six in the second half with Durham out — with four receiving heavy minutes. Robert Phinisee played 39. Juwan Morgan played 36. Justin Smith and Langford played 34 a piece. “Hopefully for our sake we can get some guys back so we can get some subs,” Miller quipped on-air after the contest. It didn’t preclude the Hoosiers from emerging victorious in this one, but you wonder if it had some effect against a hard-playing, scrappy, undersized UT Arlington squad that gave them a run for their money in the second half as IU’s regulars got essentially no rest. After running the lead up to 20 early in the second half after some quick scores, Indiana’s lead fell all the way to one with 6:33 to go as the Mavericks, who were just 1-of-12 from distance in the first half, heated up from deep in a big way. Edric Dennis was 5-of-10 (13 points) after the break, hitting three 3-pointers and scoring in the lane to boot. It didn’t help that Indiana’s turnover issues carried over from the Arkansas contest, as the Hoosiers turned the ball over on a quarter (18 turnovers) of their possessions in this contest, a season-high. Every player that saw time had at least one. Justin Smith had six, though he was 5-of-8 from the floor for 13 points. Langford had four, one being nearly identical to a mishap he had against Arkansas, a pass from the left wing that got picked off at the top of the key. But over the final 7:38 of the contest, Indiana never turned the ball over, which helped them close out the contest on a 17-4 run to seal the deal. The Hoosiers weren’t great from distance (2-of-12), though Damezi Anderson hit a key one late from the left corner to ensure victory. The Hoosiers were a decent 16-of-23 (69.6 percent) from the line, but that can be better. Juwan Morgan really threw his weight around to the tune of 23 points and 10 rebounds, six of those coming on the offensive end. Playing just days before Thanksgiving sandwiched between two other contests, this was far from a peak performance. And that was perhaps to be expected. If Indiana keeps going this way, there will be some cause for concern. But this is one of those ones you learn from and don’t dwell on too much as you keep moving forward.